Each week my wife and I drive for Meals on Wheels. Our regular route covers a portion of downtown Redwood City: Meals on Wheels tries to assign drivers to a route within a familiar area, and my wife and I certainly know our way around our downtown! In this part of the Bay Area, Meals on Wheels covers most of San Mateo County, delivering nutritious, ready-to-eat meals that are lovingly prepared in an industrial kitchen in Menlo Park. Because my wife and I live and deliver in Redwood City, every week we make the drive from home to Menlo Park to pick up the food, then back to Redwood City to deliver it. Afterwards we make the round-trip again, to return the insulated containers that keep the hot food hot and the cold food cold as we make our deliveries. The most direct route between Redwood City and Menlo Park is straight down El Camino Real. That means that each week I get a good look at Menlo Park’s various development projects, most of which are located on or near El Camino. Like Redwood City, these days Menlo Park is abuzz with development projects—although on a much smaller scale, given the fact that Menlo Park is a lot smaller than Redwood City (Menlo Park has about 32,000 residents and occupies about 9.8 square miles of land, while Redwood City has about 86,000 residents and takes up about 19.4 square miles of land). 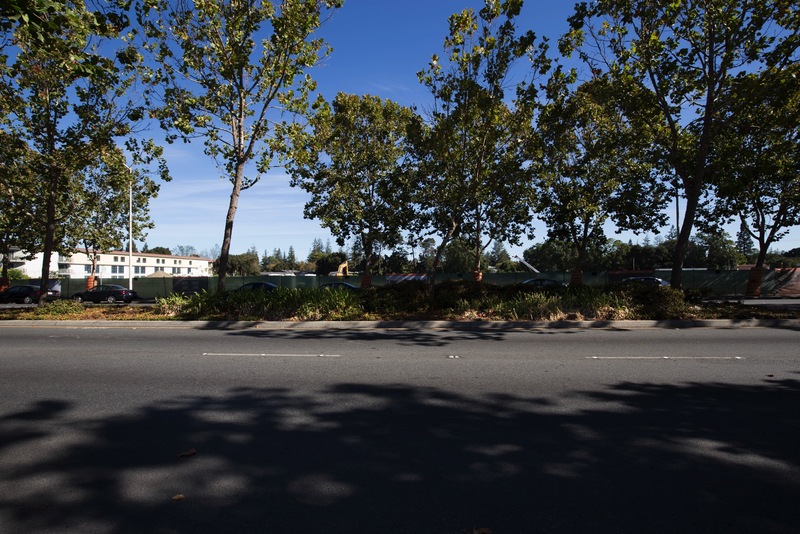 Simply by driving along El Camino Real one can observe three good-sized projects in active development in Menlo Park. As well, there is a fourth just one block over, on Alma Street. 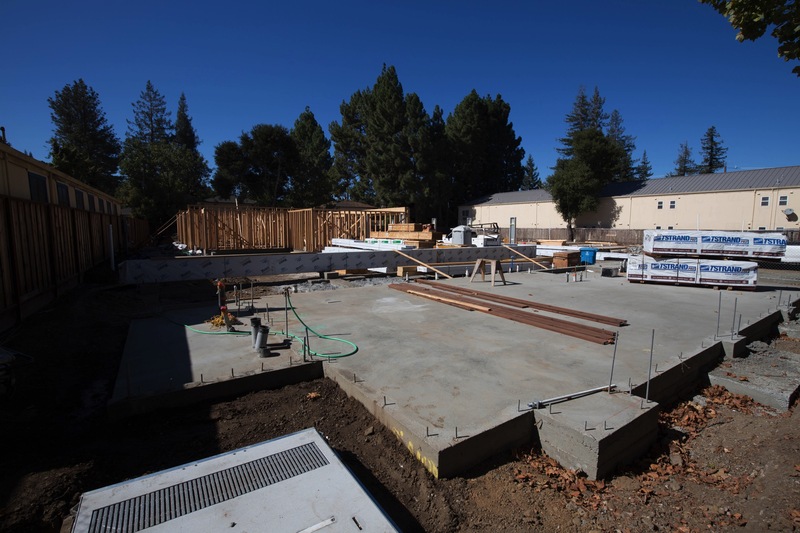 The largest of the four by far is one that has just recently broken ground, on land that at one time was home to Cadillac Buick Pontiac GMC of Menlo Park. That dealership closed many years ago, and some time afterwards the buildings were razed, leaving the 6.4 acre site with nothing but a few bits of concrete foundation and a lot of weeds. I’ve been watching the empty site for many years now, wondering when someone would come along and revitalize it. When I first spotted heavy equipment on the property, I watched to see if the equipment was actually being used on site, or was being used elsewhere and simply being parked there when not needed. It was tough to tell: not until signs were posted on the construction fencing did I knew for sure that the long-empty lot was finally getting a new lease on life. As you can see, drivers along El Camino Real (which runs along the bottom of the plan) and Oak Grove Avenue (which runs along the right side of the plan) will have a clear view of the development’s restaurants and retail spaces, which are highlighted in pink here. 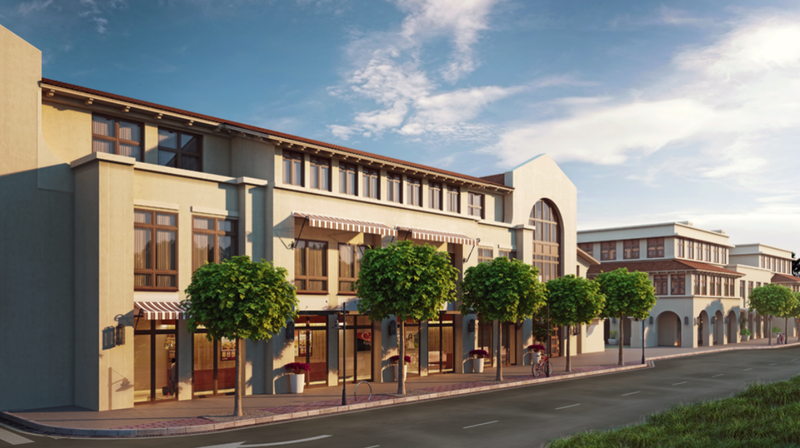 The two office buildings, which will each be three stories in height, will sit behind the three-story restaurant/retail spaces along El Camino. 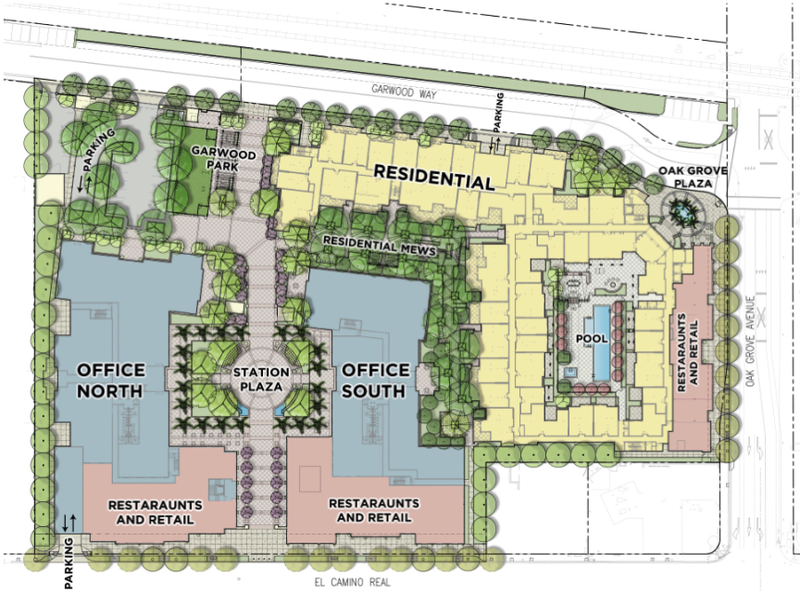 The giant residential building (about 200,000 square feet in size, and shown in yellow) will largely face a newly extended Garwood Way (Garwood Way, which runs alongside the Caltrain tracks, currently does not run the length of the property) and will sit just behind the restaurant/retail space that fronts onto Oak Grove Avenue. 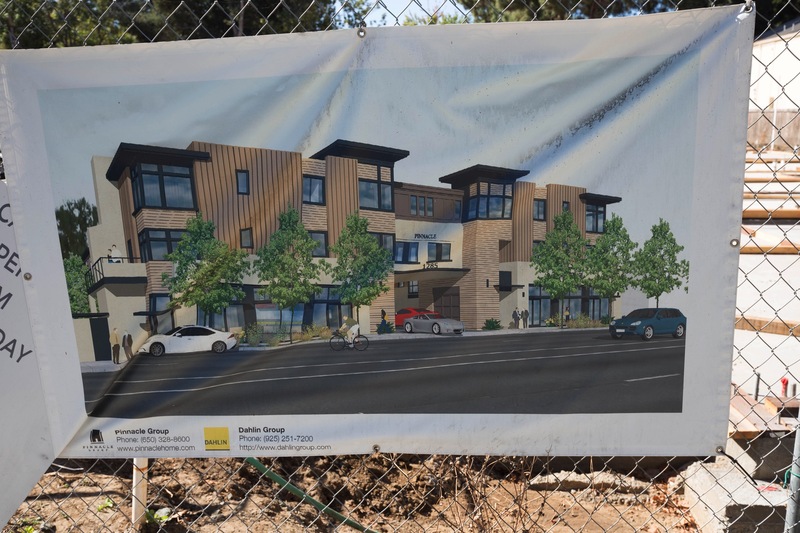 From El Camino Real, a portion of the residential building should be easily visible behind the two parcels on this block that are not part of the project: Menlo Park Chevron, which sits on the corner of El Camino and Oak Grove, and the next-door Jason’s Cafe. Within the residential building there will be a mix of one-bedroom, two-bedroom, and three-bedroom apartments (with the vast majority being one- and two-bedroom units). Expect to see this project wrap up and begin leasing sometime in 2019. This one is called Pinnacle and it, too, is a mixed-use project—although on a much smaller scale. Prior to this project breaking ground this site was home to two small buildings that housed “Dancer Dejour,” “Susan’s Nails,” and a number of private offices. Facing the building the two retail spaces will be on either side of a central driveway that provides access to the development’s parking. That parking will be for both residential (24 spaces) and commercial (eight spaces) use. The limited number of parking spaces for commercial use apparently limits the retail spaces to “retail, personal service, or non-medical office uses”; neither can be used for a restaurant or cafe. But they may not be shops, either: it seems that the project’s developer and the project’s architect are both considering moving into those retail spaces. Ten more apartments will range along the sides of the property, behind the retail/residential space and thus not visible from El Camino. Those ten apartments will be “townhouse style” units, generally with garages and (in some cases) a bedroom and bathroom on the ground floor, living and dining space on the second floor, and bedrooms and bathrooms on the third floor. 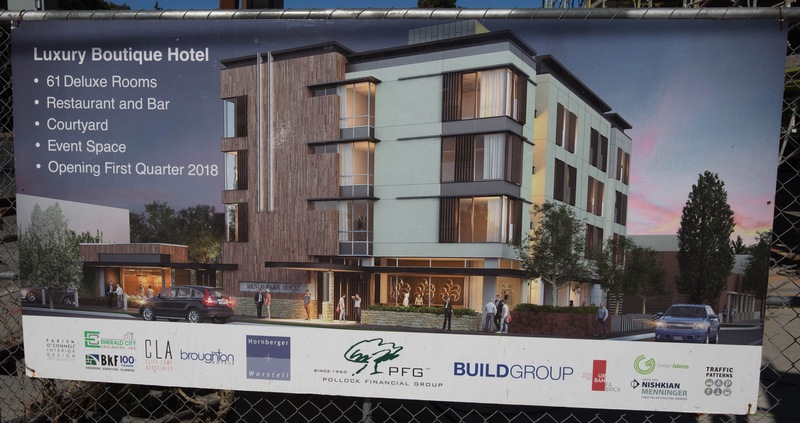 But in case you’re giving thought to moving into one of this project’s apartments, don’t: the project’s developer plans to furnish the units and lease them, fully furnished, as corporate rentals for about $10,000 a month. The above rendering includes the fact that the hotel should open “first quarter 2018”; based on the visible progress so far, that actually appears to be a reasonable estimate. 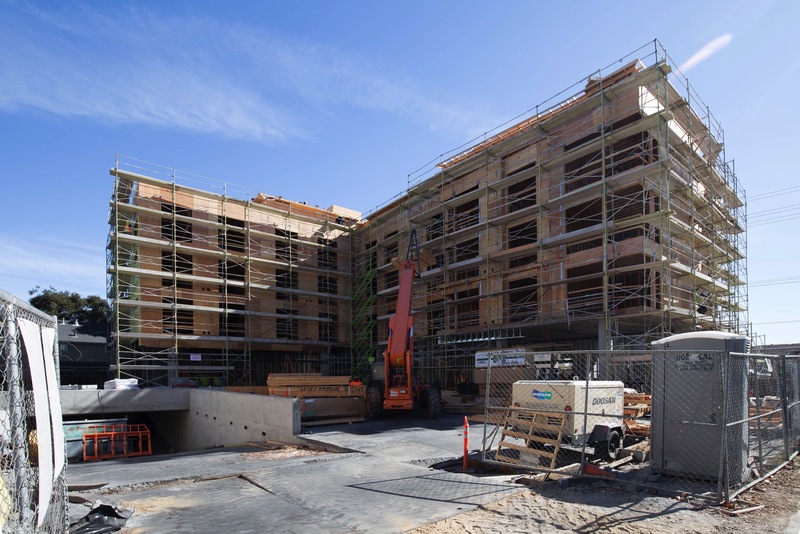 Like the luxury hotel being built on El Camino Real at Valparaiso Avenue, the Schmidt’s building will also sport a rather modern design, with walls made of a mix of concrete and “fiber-reinforced rain screen panels” (that look something like wood) on the two lower floors. The topmost floor will be all glass, with a flat, sloped, metal standing-seam roof. Curious? Check out the elevation drawings here. 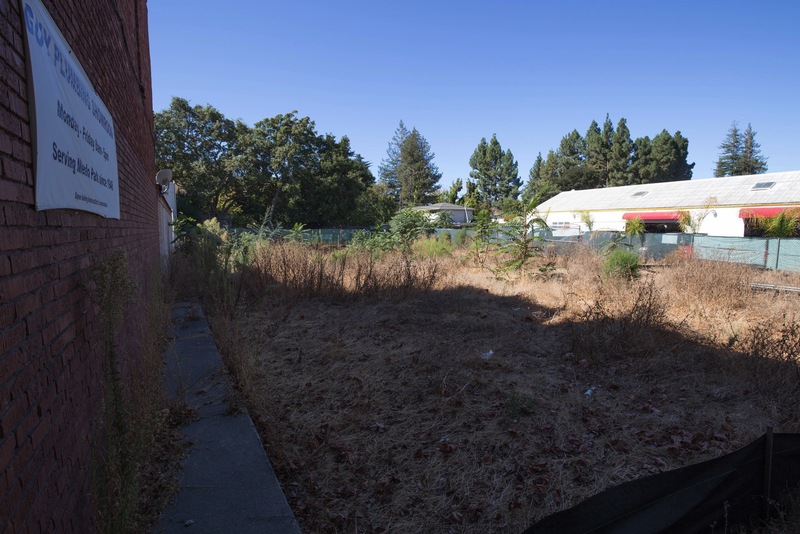 In September of last year Menlo Park’s Planning Commission approved the design for a mixed-use building to be built on this site. The proposed three-story building would have one level of underground parking, a small retail space in front of additional parking on the ground floor, about 9,000 square feet of offices on the second floor, and three condominiums on the third floor. Since the project was approved it appears that the architect has completed the construction drawings, since they are required for a building permit—which the developer applied for last June. However, that permit has yet to be issued and thus construction has not yet commenced. When it does, though, I’ll let you know! My blog focuses primarily on Redwood City, but I’m well aware that city borders mean little to most Redwood City residents—that projects and other goings-on in nearby communities are almost as interesting as are those in Redwood City. Thus, although the lion’s share of my blog posts will continue to focus on Redwood City, I will occasionally provide an update on goings-on beyond our borders. This week, it was some interesting developments in our neighbor to the south. In the not-too-distant future I’ll once again provide an update on San Carlos. And in between, of course, I’ll continue to walk through and write about Redwood City. Your blog was forwarded to me. Love hearing about what is going on in our neighborhood and surrounding area. But, do the developers and the city have a solution for the horrendous traffic? Traffic is an issue that the entire Bay Area is struggling with, and not something that a single city is going to be able to have a meaningful impact on, I suspect. We seem to be the victim of a booming economy: when the local companies are doing well (as they are right now) our traffic situation suffers. Unfortunately, although things would get better in a recession, I’m guessing that most of us wouldn’t really want that. It would be great if more people would move closer to where they work, but good luck getting enough people to make that kind of a move! It’s a tough issue, that’s for sure. More transit-oriented housing (and ways to get from transit to work without using a car) will help, somewhat, but realistically that’s only going to make a small dent in the situation. How interesting that developers in Menlo Park (of all places) can still turn a profit with buildings five stories or less. Meanwhile, back in the RWC the hucksters who pitched us the Downtown Precise Plan convinced our City Council that developers wouldn’t invest in our Downtown unless they could build 8-12 stories. This is only a taste of things to come. Hope everyone realizes Sequoia Station is zoned 10-12 stories! I certainly haven’t forgotten about that project! I wrote about it last December (see https://walkingredwoodcity.com/2016/12/23/upping-our-cred/) and am planning to write about it again once the project is fully approved and starts to get underway. But thanks for the reminder – I probably should have mentioned it in this post. Menlo has lots of nice big parks … Nealon, Sharon & Sharon Hills, Burgess/Civic Center, Willow, Bedwell Bayfront and Flood Park (to name a few, not counting schools when not in session)! The recently-approved Stanford project along ECR near Middle will have a bike/ped Caltrain undercrossing over to Burgess/Civic Center Park. Station 1300 will have some benches, at least, although no parkland to speak of. Indeed more parks would be nice but of course the property owner isn’t likely to give their land up for a park–the city would have to buy it, and given what things cost these days that would take a nice chunk out of the city’s budget. Although perhaps they have a fund for things like this; I’m not nearly as familiar with Menlo Park’s government workings as I am with Redwood City’s. I’d love to see more public benches scattered about, especially along streets where walking is being encouraged. They provide a much-needed respite for those of us who choose to walk, and I’m sure that the elderly and the handicapped would really appreciate them.